Three life-saving rings have been put in place at various points along the River Spey, from Fochabers downstream towards the sea. These items were bought by the Fochabers community fire station after numerous fundraising events and donations from the local people who realised how vital they would be for the area. The River Spey is one of the most popular fishing areas in the whole of the United Kingdom, with thousands of visitors arriving every season to attempt to catch some salmon. A spokesman for the Fochabers Fire Station highlighted the importance of the equipment to the region. He said: “We are a community fire station and we identified the large amount of people who use the Spey, but if they get into trouble or difficulty, there used to be nothing there to help them. “We identified the need for them to be there until help arrived and identified three hotspot areas that would be best suited for the life-saving rings to be placed. An official opening ceremony for the rings will be held on Friday, with local community leaders invited to help raise awareness about the fact they have now been installed along the banks of the Spey. The final ring was put in place last week at Tugnet, which is close by the Spey Bay Dolphin Centre. 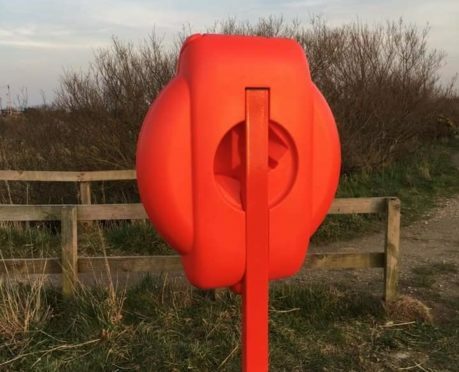 The Moray Coastguards also hailed the installation of the rings as a very “worthwhile project” and offered advice on social media about the best practice in using them. They posted: “Our colleagues from Fochabers Fire Station have completed installing life rings at various points along the River Spey, from Fochabers downstream to the sea. “This was a very relevant and worthwhile project carried out by the firefighters to enhance safety by the water. “If you have to deploy a life ring into the water, please do not put yourself at risk, aim to land it near the person in the water and encourage them to get to it and wear it.